Fixed a tiny error in the monitor-volume script. Like last time, today we’ll be covering a topic that will be useful to Pi users in general, not just those who’ve built arcade cabinets: how to use a rotary encoder to control your Pi’s system volume. If you don’t yet know how to solder or splice, you may want to postpone this project until after you learn. Though I’m quite satisfied with the speakers I got, they don’t have their own volume knob, so if I want to change the volume I need to do it in software. Somewhere in the EmulationStation menu system, perhaps three levels deep, there’s a way to launch a utility that lets you set the system volume. That’s not good enough. The emulators themselves keep their own volume setting. The ones that support libretro will allow me to set a universal key binding for controlling volume, but (a) that requires me to learn and remember an obscure button combo, and (b) not all of RetroPie’s emulators support libretro, and the ones that don’t each have a different hotkey for setting volume. Not good enough. Instead I resolved to solve this with my own hardware. Surprisingly, we’re off the beaten path here — though I’m certainly not the first person to need this, my searching didn’t turn up a canonical “how to put a volume knob on your Pi” guide. The volume knob has been around forever. For instance, if you’re old enough to want to build an arcade cabinet, you probably remember your grandparents’ TV and how it didn’t have a remote, which meant you had to twist a knob on the set itself to control the volume. Simpler times. Knobs are less ubiquitous in this age because of the whole analog‐to‐digital shift, and because knobs don’t really work well on remotes. But knobs are great for physical interfaces! People understand them. They allow for fast, precise adjustments. They don’t take up much space. But because we need a knob that speaks digitally, we’ll be using a rotary encoder. Rotary encoders, as the name implies, turn rotation into information, but in a far different way from your ordinary analog knob. The feeling of turning the knob on a rotary encoder makes clear that this is a digital operation: there are a certain number of increments on the knob (called steps or pulses), and if you turn it slowly you can feel each one “click” by. There’s one more crucial difference. Consider your grandparents’ TV again: if you keep turning the volume knob clockwise, it’ll stop turning when it reaches its maximum volume. And the position of that knob acts as the single source of truth. There’s no way to change the volume other than turning that knob. When TVs started including remote controls, suddenly volume needed to be changed from two different places. Hence the volume knob and its absolute scale got replaced with the relative scale of “volume up” and “volume down” buttons. That’s why the rotary encoder suits us so well: it can be turned in either direction as much as you like. All it knows how to do is report clockwise pulses and counterclockwise pulses. On a 24‐step knob, if you turn it clockwise ¼ of the way around, it’ll report “six pulses to the right.” So the encoder won’t get confused if the volume gets changed by another means without its involvement. It just says “louder” or “softer.” If we’re already at maximum volume and it wants us to go louder, we can just ignore it. I picked this one up from Adafruit, but any will do. This one also lets you push the knob in and treats it like a button press, so I’ll use that control to toggle “mute” on and off. As always, you can use different pins. Pick whichever ones suit your needs. Just note what gets put where so that you can refer to them by number in the code. At this point, if you’ve got the knob attached, all that will happen is that it will send signals to the Pi in the form of GPIO pins pulled high or low. But “general‐purpose input/output” means that these pins have no meaning of their own. Just as we did last time with the power button, we’ll have to monitor those pins and convert their signals into intent. The approach will be the same as last time: write a Python script that listens for signals and turns them into commands, then make that script into a daemon that runs on every boot. The execution will be a bit more complicated because we’ve got several different pins that need monitoring and a more complex state to manage. First let’s look at the script. It’s far too long to consider line‐by‐line the way we did last time, but I’ll try to hit the bullet points farther below. # pin set high, it'll be reverse. """Turn the volume up by one increment.""" """Turn the volume down by one increment.""" opposite of its current state). # value we had so we can restore it later. # volume we had previously. """Returns a description of the current volume level and mute state.""" # `amixer` in order to save us the trouble. # quite a bit and we want it to be as fast as possible. # We only care about the last line of output. # line to find them. # Shell out to `amixer` to set/get volume. # we can catch up by only calling `amixer` once at the end. # as little work as possible, so all they do is enqueue the volume delta. # but when it's not being turned we're not looping at all. # a very long timeout, then Ctrl-C works as intended. No idea why. # an empty queue and go right back to sleep. Cripes! This is a lot of code. We’ll talk about what it’s doing in just a minute, but first let’s see if we can get it to work. Now edit the file with your favorite editor. The “Settings” section near the top of the script will let you define which GPIO pins you’re using and how you want the volume control to behave. The tool we’ll be using to control system volume is called amixer. It quantifies system volume as a percentage. For my cabinet, I decided that one click of the knob should change the volume by one percentage point, and that it should top out at 96% (as a precaution against audio distortion) and bottom out at 60% (at which point I couldn’t hear a damn thing through my speakers). Your results may vary. Also consider the INCREMENT constant; if you find that you’d like the volume to change more rapidly when you turn the knob, you can change this number to 2 or more. When you turn or press the knob, the script should report what it’s doing. If everything is working, we can daemonize this script and declare victory. But first I want to explain what the script is doing. If you don’t give a damn, skip this very long section and I’ll see you near the end of this post. A RotaryEncoder class whose job is to listen on the rotary encoder’s pins and turn the signal into the information we care about. When we instantiate it we’ll give it two functions. One of them gets called when the knob turns in either direction. The other gets called when the button is pressed. A Volume class whose job is to know what the current volume is and how to tell amixer to change or it. A section near the bottom where we create one instance of each of these classes and write some glue code to make them work together. Let’s see if we can get an understanding of what’s going on here without becoming GPIO experts. …which is just what we needed in the power button script from last time. But it won’t work here — we need to listen for three different pins changing. Our goal with this class is to encapsulate all the logic needed to turn rising and falling signals into the atoms we want: volume up, volume down, or toggle mute. The GPIO library lets us treat this “falling” voltage as an event that we can attach a function to. And because the physical world isn’t always elegant, we debounce for 500 milliseconds — i.e., after the first fire, we ignore any subsequent fires for the next 500ms because we assume they’re just a flickering signal rather than additional button presses. The knob itself is a bit trickier. The button only has to distinguish between pressed and not‐pressed, but the knob has to distinguish between three states: idle, one pulse clockwise, and one pulse counter‐clockwise. That’s why it needs two pins (A and B) to report its state. We listen for changes in both pins, but we only act when both pins are once again high. If they aren’t, we exit the callback early. This means that when they are both high, we’ll be inside the callback that was triggered by the second pin’s change. Since we know which pin triggered a given callback, that’s how we can figure out which direction we were turned. We invoke the callback with either -1 or 1. By the way: sincere thanks to the authors of pigpio — a different GPIO library with bindings in many different languages. The logic I’m using is a near‐direct adaptation of one of their examples. The way to change the Pi’s system volume is to use the amixer utility. Running amixer get 'PCM', for example, will return a few lines of output that show the state of that audio device. Running amixer set 'PCM' 90% will set the system volume to 90% and will return those same few lines of output. So that’s what our Volume class is doing. It exposes methods for incrementing and decrementing the volume and for toggling muting. On initialization we get the current volume state, and after every change we make to the volume, we parse the output of amixer to make sure we’re staying in sync with what the Pi is reporting. There are also a few weird states we can get ourselves into. What should happen if someone turns the knob when the volume is muted? Should it implicitly unmute? What if the volume was muted when the script started — how do we know what volume to restore when we unmute? The class has answers for these questions and others. Here’s what I know about threads: don’t use them. That’s the advice that I’ve heard over and over again. They’ve fallen out of fashion compared with other concurrency strategies that offer more safety through tighter constraints. But, hey, that’s the hand we’ve been dealt here. We’re using a library that handles certain tasks in a background thread for a legitimate reason. So I need a multi‐threading strategy. My strategy will be to minimize the amount of concurrency happening for my own sanity. The main thread instantiates everything and sets up the GPIO events, then goes to sleep. As its last official act, it signals to the main thread that there’s work to be done. It does this via threading.Event, which is a simple way for one thread to go to sleep until another thread gives it a signal. When the main thread wakes up, it consumes the queue in order. It interprets every item in the queue as either a volume increment, a volume decrement, or a mute toggle, and then calls the appropriate methods synchronously. It then goes back to sleep until another callback wakes it up. By making the main thread do all the work, we’re re‐imposing a sane programming model that we can easily reason about. We’re guaranteed not to miss any change events, and we’re guaranteed to act on every single one of those events even if the main thread is being called less often than we’d like. Could we do more work in the callback threads? Probably. I think the Volume class is thread‐safe. But why bother? We don’t need it for performance, so it’d only be widening the range of things that could go wrong. When we minimize the amount of work done in background threads, we can be more confident that our code is actually doing what we assume. That should do it. Your volume knob should now be working. It should still be working after a reboot. Test it out using whatever method makes sense for your Pi; since mine is an arcade machine, I can easily test it by launching a game and letting it go into attract mode. Right below the monitor for quick access. After the rocker switch’s removal, the volume knob was the obvious candidate to take its place. The existing hole was too wide, so I ended up widening the hole further and super‐gluing a washer in place. You can see how sloppy this is in the photo, but eventually I’ll get a slightly larger knob to hide this shame. Installation is straightforward. Much like the buttons we installed, the encoder does a nut/bolt thing to hold it in place. The knob goes over the top of the shaft. You can probably find a fancy knob that will suit your needs — just make sure you have the space for it and that it’s the right size and shape. 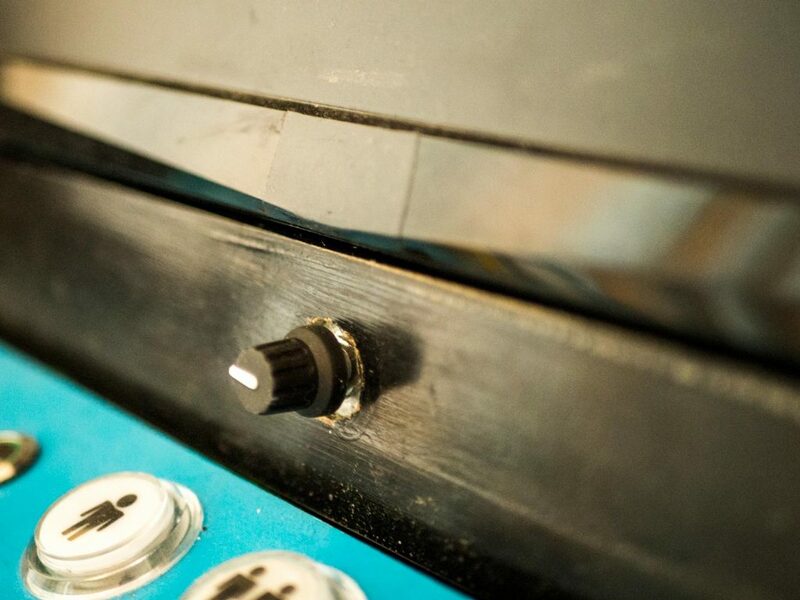 There are lots of knobs out there and it’s trickier than you think to find one that will fit your specific encoder. In part five I left you with a cliffhanger: we’d managed to turn the Pi on and off with the press of a single button, but not the monitor or marquee light. Next time I’ll show you how I used an Arduino to keep all three in sync. I managed to setup your script and if I run the monitor-volume in Debug from the command line it works but when I run it as a service although he service installs fine and starts fine, he volume doesn’t change or mute… any ideas? Any ideas on the best way to proceed? I’m not a Python coder but that did the trick – now the code runs at boot (thank God Python logic works the way you’d just expect, y’know, logic to work). Except without the mystery %%%NO-NEWLINE%%% line. That was the comment field, not me! That’s an artifact of some (apparently buggy) text processing code I’d written! Cleaned it up for you. Hi Andrew – been looking for something like this for my arcadebuild. I do run into some problems. I cant get past 96% volume. Sometimes it jumps to 95, 94 or 93 % but always goes back tp 96 next turn on the know. I’m new to all this. Can you please tell me how to hook this encoder correctly to work with your script? The pins on this encoder got different names..
Manu thanks for your time!